The wetland was purchased by Camp Newaygo in 1984. The acquisition of the wetland not only expanded our opportunities for wetland study and educational stewardship, but was also significant since it preserves a valuable part of our greatly diminishing wetland areas. The wetland has two 1/2 acre hidden lakes surrounded by 10 acres of sphagnum bog which hosts very unique plant life. The entire area is surrounded by a cattail marsh and the very diverse wildlife a wetland supports. 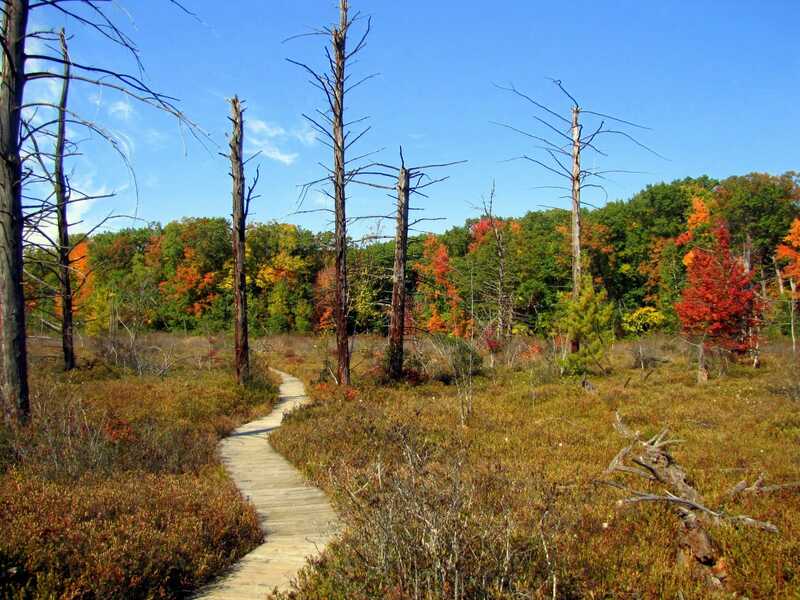 Because of the fragile nature and inaccessibility of the bog, an established nature trail makes this area available to the community and camp participants to learn from and enjoy. 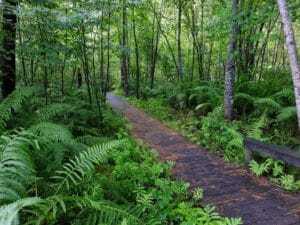 The wetland trail was constructed in 1986 by a number of hard working men and women. The wetland trail was graciously funded by the Fremont Area Community Foundation. 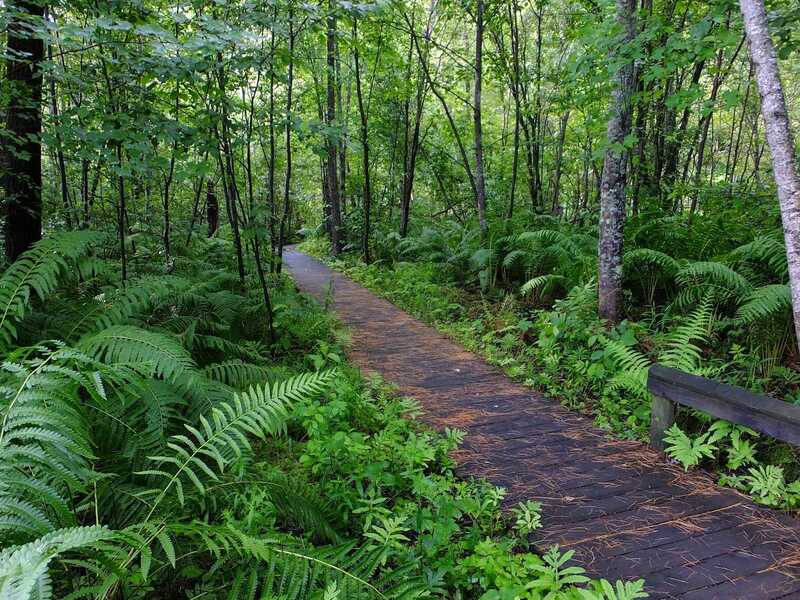 In 2013 construction began to expand the trail to include the second hidden lake and added another 1/2 mile boardwalk. Wetlands are characterized by the presence of water that saturates the soil or covers the land for most or all of the year. This leads to the development of plant and animal communities that differ from those found in purely aquatic or dryland environments. One of the most distinctive kinds of wetlands are bogs. They occur primarily in formerly glaciated areas of North America and Canada. When the last glacier melted, it left behind numerous depressions of various sizes which filled with fresh water to become lakes, some of which were formed in such a way that no natural drainage was possible. It is these isolated lakes that become bogs as sediment from surrounding areas are washed in and accumulated. The combination of soil type, lack of drainage, and presence of sphagnum moss make bogs highly acidic, and also oxygen and nitrogen deficient. The bog is a perfect place to introduce children to the diverse environment around them. 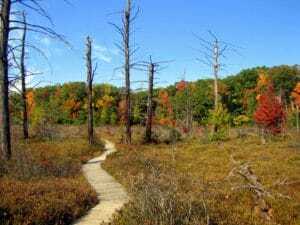 The trail is open to the public during daylight hours, and Camp Newaygo has guidebooks available to borrow for your trek. Stop by our office Monday-Friday from 8:00 am to 5:00 pm to check out a book!